You don't want your unfinished attic cooled by your air conditioner. To prevent this, follow the air sealing and insulation strategies in this guide and make sure the attic is well-ventilated using passive vents and natural air flow. Laying fiberglass rolls is easiest for a DIY job. If you have any type of insulation between the rafters, install the second layer over and perpendicular to the first (again, the second layer of roll insulation should be unfaced — with no vapor retarder). This will help cover the tops of the joists and reduce heat loss or gain through the frame. Also, when laying down additional insulation, work from the perimeter toward the attic opening. Never lay insulation over recessed light fixtures or soffit vents. Keep all insulation at least 3 inches away from "can" lights, unless they are rated IC (Insulated Ceiling). If you are using loose fill insulation, use sheet metal to create barriers around the openings. If using fiberglass, wire mesh can be used to create a barrier. For additional details and images, download the Seal and Insulate DIY Guide (PDF, 12.8 MB). To completely cover your attic floor with insulation out to the eaves you need to install rafter vents (also called insulation baffles). Complete coverage of the attic floor along with sealing air leaks will ensure you get the best performance from your insulation. Rafter vents ensure the soffit vents are clear and there is a channel for outside air to move into the attic at the soffits and out through the gable or ridge vent. 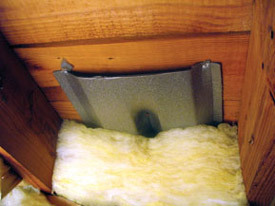 To install the rafter vents, staple them directly to the roof decking. Rafter vents come in 4-foot lengths and 14-1/2 and 22-1/2 inch widths for different rafter spacings. Rafter vents should be placed in your attic ceiling in between the rafters at the point where your attic ceiling meets your attic floor. Once they are in place, you can then place the batts or blankets, or blow insulation, right out to the very edge of the attic floor. Note: Blown insulation may require an additional block to prevent insulation from being blown into the soffit. A piece of rigid foam board placed on the outer edge of the top plate works very well for this. Place rafter vents in between the rafters where the ceiling meets the floor. 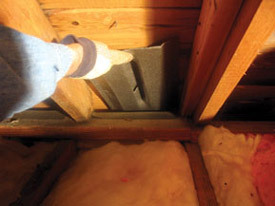 Add insulation around the rafter vent and out to the edge of the attic floor.